IMAGE ABOVE: Shelley Carrol featuring Paul Ellington performing in the DMA’s Jazz in the Atrium. Photo courtesy of the DMA. Meg Brooker and Misha Penton in Divergence Vocal Theater’s production of Klytemnestra, the original subversive female, a chamber opera by Dominick DiOrio, composer and Misha Penton, libretto, at the Museum of Fine Arts Houston. Photo by Dave Nickerson. I spend a lot of time in museums, and sometimes I stay to look at the art on the walls. Each month, as I compile the performance end of the EYES on TEXAS section, I realize that I’m listing a museum as the venue more often these days. Are museums the next concert halls? I’m not alone in wondering this, SXSW Music 2014 offers a panel, Museum Music: Art Galleries as Performance Space, with Blanton Museum of Art’s SoundSpace series as case study. It also occurred to me that some of the most exciting music performances that I have seen in past years have taken place in museums: Misha Penton’s two MFAH shows, Voix et Harpe (a little Frenchiness) in the Audrey Jones Beck Galleryand Klytemnestra in Gallery 212, with Anton von Maron’s 1786 painting, The Return of Orestes, as a backdrop (Penton also performed this piece as part of Late Nights tied to The Body Beautiful in Ancient Greece: Masterworks from the British Museum at the Dallas Museum of Art). Violinist Todd Reynolds premiered Bill Ryan’s A Simple Place during one of Musiqa’s Loft concerts as part of the Answers to Questions exhibit at Contemporary Museum of Art Houston; and Sarah Rothenberg and Marilyn Nonken’s performance of The Rite of Spring in Da Camera’s Diaghilev’s Paris at the MFAH took place in conjunction with the Picasso Black and White exhibit. There doesn’t always have to have a connection to an exhibit to make for a meaningful experience. Windsync’s pre-Carnegie Hall pop-up show on the lawn of The Menil Collection provided a perfectly pastoral Sunday post-art watching activity. The Menil is known for its broad programing, and long association with Da Camera Houston. Next up at the Menil through Da Camera is American pianist Simone Dinnerstein playing Bach, Monk and late Beethoven on Feb. 25. Really, I could go on and on, and this is just for Houston. There’s a host of museum-based musical events going on Dallas, Fort Worth, Austin and across the state. In fact, it’s not usual to see a performing arts tab on museum websites. As a poly-art watcher, I’m always happy to see audiences cross-pollinate, and they don’t as much as we like to think they do. I tend to get downright giddy when I see people from one art silo enter another. It makes perfect sense that museum folk love music, so maybe it’s the best first step toward a more inclusive art-going culture. Most of these events are tied to exhibits, which offers a chance to deepen understanding across the disciplines. Making these connections with audiences and ideas is simply a smart choice from every angle. Still, I wondered how it all came about. We can trace almost every note heard at the MFAH back to one woman, Margaret Mims, a tall, elegant woman, who serves as the museum’s Interim Education Director. I sat down with Mims and her team to hear the story of how music entered the museum about a decade ago, which turns out to be quite organic. The first event, a walk-through, really a sing-through, of the galleries with the choral group Cantare proved magical, with the choir singing songs from the time period of each gallery. After a few iterations of this successful event, the crowd grew to 200, which meant curators worried about the art. The stroll-throughs are gone, but the idea of music in the museum endured. Then the Beck building came into being, along with Gallery 212’s fine acoustics. Over the decade, such distinguished groups as Ars Lyrica, Da Camera, Mercury and Houston Friends of Chamber Music (HFCM) have graced the galleries. 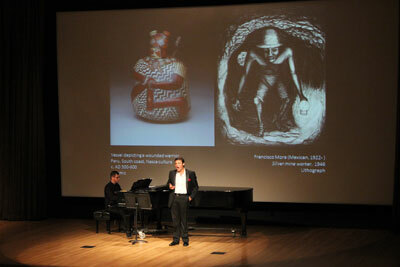 HFCM, now in its third year of collaborating with the MFAH, recently presented The Viennese Tradition featuring Trio SLAVA, in conjunction with Koloman Moser: Designing Modern Vienna 1897–1907. Ticket holders had the option to tour the exhibit before the show. Craig Hauschildt and Blake Wilkins performing as part of Musiqa’s Music Outside the Lines at the CAMH. Photo by Max Fields. Rather that having set programs in place, Mims creates events depending on what works best with each exhibit. She is the first to admit that there is a learning curve when it comes to dealing with tickets, joint publicity and other nuances of being a co-presenter. Although she imagines a time when a template is in place, there is something thoughtful in the way programs are put together. Their relationship with Cantare continues to this day, with a holiday show on Dec. 21-22. Oh, and all the creativity packed into Artful Thursdays, now in its 17th year, can be traced right back to Mims as well. The DMA has been at the music biz for a while now. DMA’s Carolyn Bess, Director of Programming and Arts & Letters Live, and Stacey Lizotte, Head of Adult Programming and Multimedia Services, filled me in on the museum’s long history presenting music under the DMA roof, which includes a 32-year partnership with the Fine Arts Chamber Players, presenting free Bancroft Family Concerts one Saturday per month. 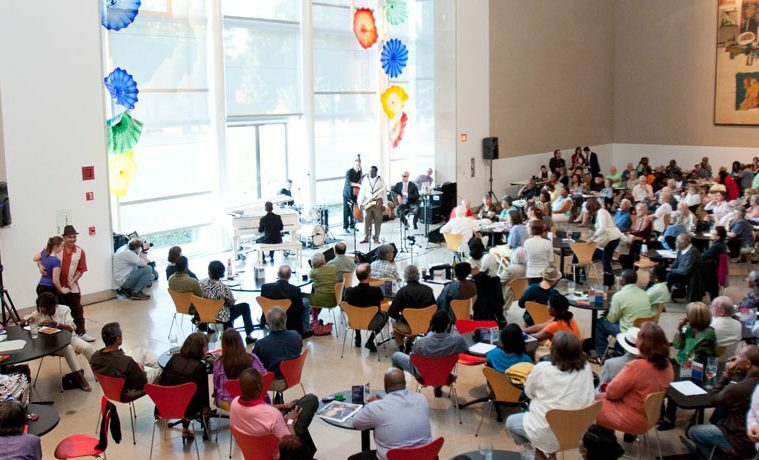 Jazz in the Atrium on Thursdays, has been going strong for two decades. Late Nights at the DMA holds steady in its 10th year of third Friday performances, while also attracting those who prefer late night art viewing. Music events take place at the Café, the Horchow Auditorium and galleries. It doesn’t hurt that DMA’s Level 4 landing in the American galleries is said to have outstanding acoustics. Their newest program, Music & Masterpieces, partners with Dallas Opera in creating a repertoire inspired by works of art or a special exhibition, followed by a staff or docent tour. In this case, the Dallas Opera approached the DMA. After a brainstorm, Music & Masterpieces was born, and the DMA and Dallas Opera audiences are co-mingling. 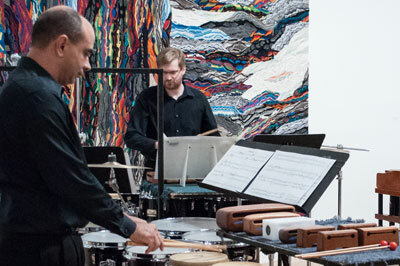 The standout program in Austin is Blanton’s SoundSpace Series, which began in 2011 as a collaboration with Steve Parker and the museum’s public programs team. SoundSpace includes a cross-section of Austin’s contemporary, classical, jazz, rock, and pop music, performance art, and dance artists. Whether it’s a tribute to John Cage or a rendition of Henry Brant’s Orbits with 80 trombones, SoundSpace moves towards creating an even more immersive experience. There’s more: Beat the Rush offers a guided musical tour with the musicians discussing how the compositions related to the art on display; and the Midday Music Series partners with the Butler School of Music. It didn’t surprise me in the least to find CAMH director Bill Arning sitting next to me at Houston Grand Opera’s sassy production of Die Fledermaus. A former member of the punk band The Student Teachers, Arning regularly fills the CAMH house with dance (that’s another story) and music, provided by such fine troupes and artists as Nameless Sound, William Basinski and Musiqa Houston, who just premiered a newly-commissioned work, Amidst These Things, by Blake Wilkins, in conjunction with the CAMH’s Outside the Lines. In fact, the Musiqa/CAMH partnership is celebrating its 10th anniversary this season. “I learned what art was in a mosh pit and some of my favorite art memories involve the field overlapping—like the night I got to sit at the Warhol table at the Lower Manhattan Ocean Club to see a John Cage concert,” explains Arning. This month, Indian Jewelry performs on Dec. 19 in conjunction with lead singer Tex Kerschen’s talk at CAMH’s music-based lecture series 20HERTZ on Dec. 12. Bringing music into museums may be nothing new, but it is growing and appears to be in full bloom across the state. These programs can potentially benefit both the museum and the musical groups, increasing audiences and visibility for both. We find cultural organizations forming meaningful friendships. The arts become less segregated places, and museums take on the role of cultural hubs, where many types of experiences can take place. Music also allows us to gain practice in abstract thinking, certainly a handy skill when it comes to visual art. For me, the partnership goes deeper. Now, when I stroll through MFAH’s French Impressionism galleries, I hear the haunting echo of Penton’s velvety soprano voice activating the space. The room just comes alive.